Product Type: Framed Art Print. Title: IRenkowo. Artist: Piotr Krol (Bax). Subject: photography, landscape, beach, nature. Frame: Distressed Rustic 1 1/2" Wood. Mat: White/silver mist grey. Image Dimensions: 19.75" x 12.75". Outer Size: 26.38" x 19.38". This Amanti Art Decorative Framed Art Piece is a home decor item you can be proud to showcase on your wall. Our craftsmen hand made this piece in a small custom art and frame shop in America's heartland. We know that each decoration you choose for your home, be it for your living room, foyer, kitchen, bedroom, bathroom or other space, is a reflection of your style and taste. 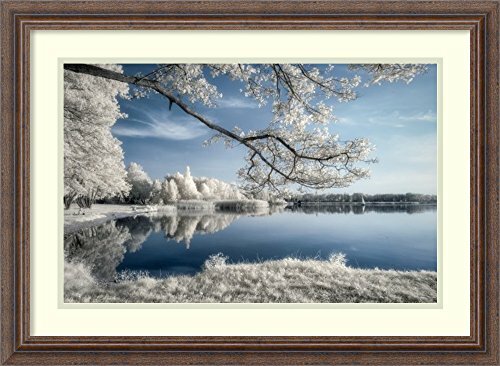 This image comes framed in a variety of colors and sizes that you can select. Choose from casual, traditional, modern, contemporary, country rustic or shabby chic styles. All pieces have durable wires already affixed to the back for easy hanging and installation. We hope you're pleased with your Amanti Art purchase! Outer Size: 26.38x19.38", Image Size: 19.75x12.75"
Frame: Distressed Rustic 1 1/2" Wood. Mat: White/silver mist grey.